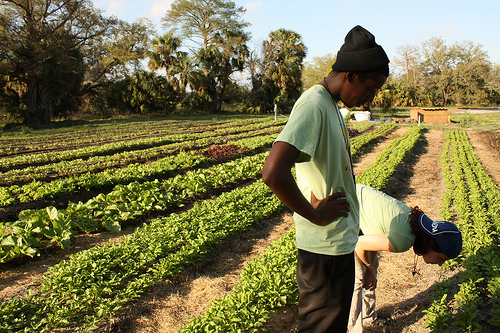 Grow Dat Youth Farm works two acres in City Park and harvests 20,000 pounds of fresh food. Grow Dat Youth Farm works two acres in City Park and has harvested 20,000 pounds of fresh food. Ten years ago, Grow Dat Youth Farm was only a kernel of an idea my mind, awaiting the right moment to sprout. Working as a high school teacher at the time, I looked out over the food landscape of New Orleans and saw a need to create an alternative first job for my students, so many of whom were employed in the fast food industry. I was confident that engaging young adults in the work of growing food for their communities could be a transformative experience for them, maybe even for the city. I knew that learning to work together to grow, sell and share fresh produce would require them to develop leadership and communication skills that we couldn’t devote as much time to in the classroom. What I didn’t imagine was that urban farming experience might also prepare them for food-sector employment that could provide a decent hourly wage, benefits, and opportunities to advance. Fast forward 10 years, and I see a new kind of food sector job emerging—not just late-night minimum-wage jobs in a fast food restaurant or earning $2.13/hour waiting tables, but opportunities to work with businesses who are growing, selling, and preparing local food. Food is not a luxury item, a fact that makes me very proud to work as someone producing it. As a friend says: “There’s no such thing as a food bubble.” That lesson was reinforced during the 2008-9 economic free fall and in the years that followed. We have no choice but to see the links between our economic and environmental challenges and to address them as one. It was a time for reflection. We are rapidly reaching the end of our ability to limitlessly produce and purchase plastic toys in a collapsing global ecosphere. (Thank you, peak oil.) So what’s next? What’s the basis of our future economy going to be? Food is becoming a focal point as we rebuild our local economies around the nation, and post-Katrina New Orleans is an interesting example. There are more restaurants in New Orleans today than before Hurricane Katrina, and many of them showcase fresh, local produce. Farmers’ markets, online retail stores, and even chain grocery stores are also responding to consumer demand for local produce. Add to that picture student-led demand for schools to offer local produce in the cafeteria. Universities alone spend $6 billion each year on food, and, thanks to skilled organizing by groups like Real Food Challenge, students around the country have pressured their schools to make commitments to buy up to 40 percent of that food locally. It’s a move that makes for healthier students and it strengthens rural communities and family farms as well as emerging urban agricultural projects like Grow Dat. We’ve also grown careers. 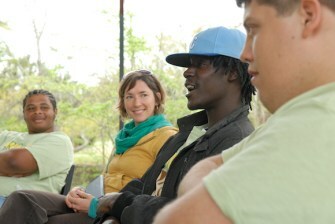 More than a dozen youth from our program have graduated into tiered leadership roles at the farm. We hire them to return as interns, assistant crew leaders and crew leaders who help select and train the next group of youth while running the farm. Gilligan, second from left, and members of the Grow Dat team stress the importance of communication skills in the job market. Over the past four years we have also developed a network of for-profit and nonprofit partners eager to hire our graduates. Last year Grow Dat alumni were hired by the New Orleans Food Co-op, the online retailer Good Eggs, Rouses, and Eco Urban landscapers. Other job openings have been sent to us from Whole Foods, Hollygrove Market and Farm, and Edible Schoolyard. These jobs, by and large, pay above the $10.10-an-hour minimum wage that President Obama now requires of federal contractors. Some even provide health insurance and paid days off. And all of these businesses are eager to hire our graduates because of the skills, knowledge and enthusiasm they bring from their training at Grow Dat. We are at a fascinating, volatile, and critical juncture. The waiting game is over. We don’t just anticipate the disruptive climate changes that scientists have been warning about; we’re living them. Meanwhile, income inequality has reached oligarchic proportions, with disparities so severe they threaten to undermine what is — or once was — America’s greatest achievement: our democracy. Teenagers and young adults are unemployed or underemployed at the highest rates since World War II. People work full-time jobs and still can’t break above the federal poverty line, while the chief executives of the companies they work for make millions — sometimes tens of millions — a year. A strong stock market will do us no good if its foundation is an economy that further degrades the basis of the planet’s true wealth — its biodiversity, its water, air and soil. We have no choice but to see the links between our economic and environmental challenges and to address them as one. That’s why I am so excited about jobs grounded in localizing the production of our food, our energy, and the products we need to live. (I don’t believe that this alone will make the dramatic change needed to slow climate change, but it’s a start.) I applaud the businesses we partner with for seeking out Grow Dat graduates, giving groups historically excluded from full participation in our economy the opportunity to bring their untapped skills and energy to the table. To build toward a more promising future we need to teach young adults not only how to do “green jobs” but also model for the next generation how to work across differences, and how to think of success as bigger than our individual gain. We need to teach youth (and learn ourselves) how to be self-reliant and interdependent, and at Grow Dat we see our small part in all this as continuing to engage young people in the meaningful work of growing food. Founding director of Grow Dat Youth Farm, Johanna Gilligan is a native of Santa Fe who has lived in New Orleans since 1999.